This Situation Update describes events occurring in Kyainseikgyi and Kawkareik townships, Dooplaya District during the period between July and November 2017, including healthcare, education, development, livelihoods, land issues and military activities. Villagers in Kyainseikgyi (Noh T’Kaw) Township area need healthcare facilities closer to their villages because poor road quality causes travel delays, which particularly impacts villagers with severe illnesses. Villagers’ illnesses sometimes worsen while they travel, and some villagers have died on their way to the hospital. 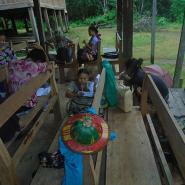 The new Burma/Myanmar government education system was a challenge for young children in Pee T’Hka village. The second year preschool was eliminated and so six and seven year old children who recently graduated from first year preschool were placed into Standard One before they were ready. Farmers in Hset Ko Maing village, Kyainseikgyi Township faced livelihood challenges because flooding and mice damaged their rice paddies. 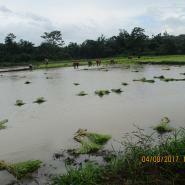 They had to regrow their paddies up to three times before they were able to produce rice. Land issues rose in T--- village, Noh Taw Pla village tract, Kyainseikgyi Township because a villager broke a community law that forbids villagers from selling their ancestral lands to villagers from other villages. A drunken KNU Forestry Officer threatened a boy from L--- village, Kyainseikgyi Township after he asked the boy to take him to his camp by motorbike. The official became angry and threatened the boy after the official fell off the motorbike and onto the road. The following Situation Update was received in two parts by KHRG on August 17th and November 4th 201 It was written by a community member in Dooplaya District who has been trained by KHRG to monitor human rights conditions. It is presented below translated exactly as originally written, save for minor edits for clarity and security. This report was received along with other information from Dooplaya District, including three other interviews, one video and 108 photograph. This situation update describes events that occurred in Noh T’Kaw [Kyainseikgyi] and Kaw T’Ree [Kawkareik] townships, Dooplaya District including healthcare, education, development, livelihoods, land issues and military activities. Villagers in Noh T’Kaw Township report that healthcare facilities are needed because they are facing several health issues. Though some villages have healthcare facilities, they are not adequate because they do not have enough healthcare workers and medical supplies. Some rural villages do not have any healthcare facilities, and so villagers have to go to the hospital in town to access medical treatment when they are seriously ill. Barriers to accessing medical treatment for rural villagers include poor transportation and distance of healthcare facilities, which cause travel delays. Because of this, some people who are severely sick, for instance, those who have severe diarrhoea, vomiting or food poisoning, sometimes die on their way to the hospital. Villagers report that healthcare facilities are essential for rural villagers. 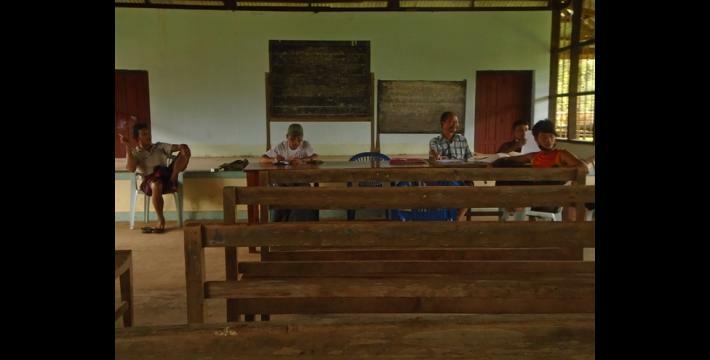 The new teaching system in the Burma/Myanmar government school in Pee Ta Hka village, Kyainseikgyi Township, Dooplaya District became a challenge for students. The Burma/Myanmar government eliminated the second year preschool and kept only the first year preschool in the new teaching system. Six and seven year old children who finished first year preschool [and would usually continue to second year preschool] were placed into Standard One. However, the students [who recently graduated first year preschool] could not read and write properly, as they are still young and not ready for formal school yet. In the previous teaching system with Karen teachers [before Burma/Myanmar government teacher entered], there were two years of preschool classes that taught the children basic reading and writing skills before attending formal school or Standard One. 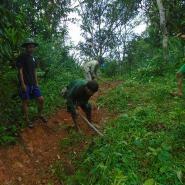 In addition, students in Ya Ther Ta village, Ya Ther Ta village tract, Kyainseikgyi Township faced some challenges. As there is only a primary school in the village, older students have to go to another school [Burma/Myanmar government school] in another village. 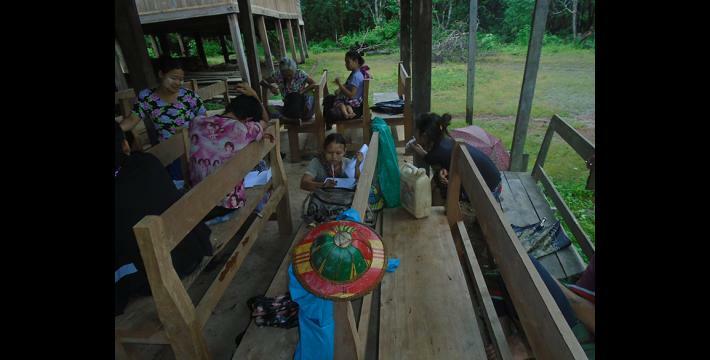 However, the children who graduated from the village primary school Standard Four were not allowed by Burma/Myanmar government teachers to study at Standard Five because they [the students] only had a Karen National Union (KNU) government certificate. Therefore, the students were made to study Standard Four again in the Burma/Myanmar government school before moving on to Standard Five. In this case, three students from Ya Ther Ta village stopped studying. 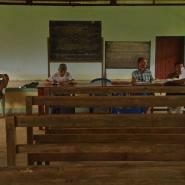 The local Karen people reported that in their view, this is ethnic discrimination by the Burma/Myanmar government teachers. Local people in T’Hka Hkee village, Noh T’Kaw Township reported that development projects benefit the local people in many ways, but things are not yet entirely satisfactory. However, electricity will be installed by the Burma/Myanmar government in the village during July 2017. Three months ago, villagers reported that rural villages such as T’Poh Hpoh Hta, Ya Ther Ta and Ya Moo Hta, disappeared from the Burma/Myanmar government village tract administration list. Therefore, villagers contacted authorities and asked them to add their village names [to the list]. As a result, On August 29th 2017, these three villages’ names were added to the village tract administration list of the Burma/Myanmar government. Then, the Burma/Myanmar government asked these three villages to document the household numbers in the village for registration. 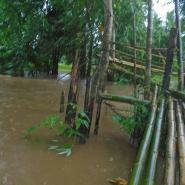 The villagers in T’Poh Hpoh Hta village, Kyainseikgyi Township, Dooplaya District faced transportation challenges, as there are no roads constructed around the village. None of the [organisations working on] development projects in the area have constructed roads in this village. 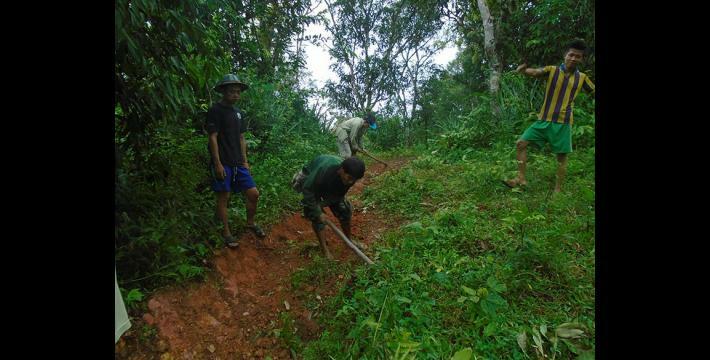 Therefore, on October 2017, the villagers in T’Poh Hpoh Hta village organised themselves and [re-]constructed the road without using machines, which they have to do every year. On September 16th 2017, villagers in Kyain village, Kyain village tract, Noh T’Kaw Township, Dooplaya District held a meeting to formulate community rules with all villagers. The purpose of the meeting was to participate in community development and empowerment. There is a development project in Th’waw Thaw village, Hsoo K’lee village tract, Taw Naw Muh Htaw area, Kaw T’Ree Township, Dooplaya District. On August 2017, the Burma/Myanmar government construction agent Yeh Win transported a front loader, excavator, dump truck, wood, and labourers to the villages. However, as of November 2017, the construction process has not yet started. 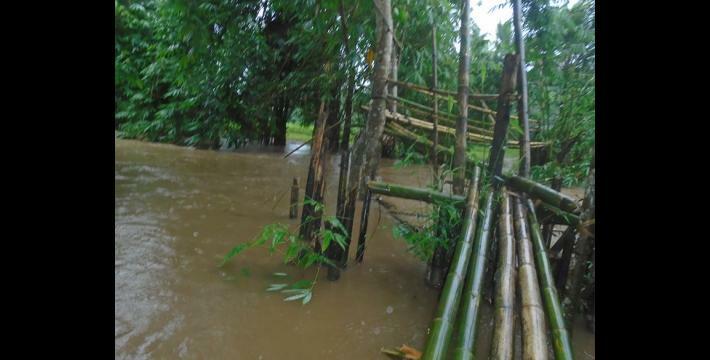 In Hset Ko Maing village, Noh T’Kaw Township, Dooplaya District, villagers faced livelihood challenges because the paddies in their farms were damaged by mice and flooding. 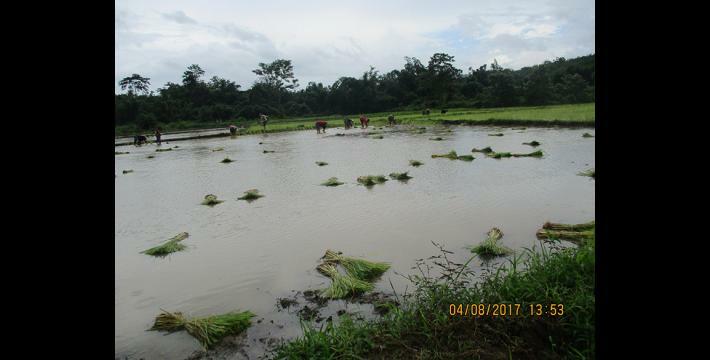 Therefore, farmers had to grow their paddies again and again, up to three times, in order to grow some rice for their livelihoods. Local people in Noh Po Htee Moo Hta village tract, Hsoo K’lee village tract, Maw Hkee village tract, and Taw Naw Muh Htaw village tract, in Kaw T’Ree Township areas secure their livelihoods by farming corn, growing bean plantations, hill farming and plain farming. On September 5th 2017, a land dispute occured that involved Naw K---, who sold her ancestral land in T--- village, Noh Taw Pla village tract, Noh T’Kaw Township, Dooplaya District. Three years ago, in 2014, Naw K--- sold her land for 300,000 kyats [US $226.59] to a T’Ku Hkee villager named Naw L--- without a land title. This caused a problem because Th’Waw Poe villagers have a rule that prohibits lands in village areas from being sold to other people [who are not from Th’Waw Poe] in order to protect local security and prevent social conflict. This incident, then, became an issue among the villagers. On July 14th 2017 in L--- village, Noh Ta Khaw village tract, Noh T’Kaw Township, a drunken KNU Forestry Officer from Noh T’Kaw Township came to the village and asked a boy to take him to his camp [military camp] by motorbike. That boy was Saw Y---, who is --- years old. The drunken Forestry Officer could not hold onto the motorbike as he was seriously drunk, therefore, he fell off the bike and onto the road. Then, the soldier became furious and claimed that the boy intended to make him fall. At that point, the boy was so scared and he went back home fearfully. The boy was so worried he could not eat when he arrived home. However, the boy told the villagers that he did not want that soldier to be punished but only to be taught the right way [to avoid doing it again]. There are different military groups in Taw Naw Muh Htaw area, Kaw T’Ree Township such as Democratic Karen Buddhist Army [DKBA; both splinter and benevolent], Border Guard Force [BGF], Peace Council, Karen National Union [KNU] and Tatmadaw. The Tatmadaw Light Infantry Battalion (LIB) #283 that operates in Noh Taw Pla and Noh Ta Khaw village tract, Noh T’Kaw Township, Dooplaya District transported their military rations and rotated their army four times between May and October 2017. Tatmadaw travelled on the vehicle road between Kyainseikgyi Town and Kyaing Don Town. The first time they sent their rations by truck with ten soldiers. The second time they returned from their camp [in Noh Taw Pla and Noh Ta Khaw village tract] with one truck and nine soldiers. The third time they returned from their camp [in Noh Taw Pla and Noh Ta Khaw village tract] with two trucks and ten soldiers. The fourth time they returned from their camp [in Noh Taw Pla and Noh Ta Khaw village tract] with three trucks with 23 soldiers. In September 2017, the Tatmadaw travelled into the Karen National Union [KNU] delimited area where they are not supposed to go. They also patrolled in villages, farms and plantations without notifying the Karen National Union (KNU). Some of them damaged villagers’ kitchen materials such as pots and plates [when villagers were absent from their houses]. All conversion estimates for the kyat in this report are based on the February 2, 2018_official market rate of 1,324 kyats to US $1. For further detailed information, see “Dooplaya Situation Update: Kyainseikgyi Township, July to August 2017,” KHRG, December 2017.